This term, a new club was started at EF Academy Oxford; the girls’ football club. There was already a boys’ football team but as a female football player, I felt like there was a need to have a team where girls could play and have an opportunity to socialize in a girls-only environment. I’ve played football since I was five years old and I absolutely love this sport. So, I introduced the idea to the school and then to some of my friends. Even though they didn’t have much experience with the sport, they were very keen to try it. There was some trouble finding a venue, but after the Christmas break, a place at Cheney School opened up and we could finally start our club. We had our first practice on Friday, January 18th, and I dare say it was a success! We had a lot of fun and I introduced the girls to some basic shooting and passing techniques. We also played some fun games and ended the practice with a match. From what the girls have told me, they absolutely loved it and I was also very impressed by their skills. The plan is to continue our practice every Friday. I also hope that we’ll be able to recruit a few more girls. Then we would have enough players to play real matches against other teams. Our coach, Tom Mayer, thinks we could even travel and play matches if we can put together a bigger team. I sincerely hope we manage to gather enough girls to develop a bigger team as I miss playing football matches. 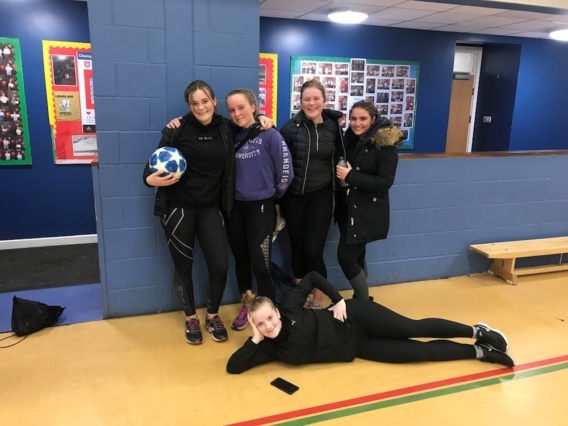 The girls’ football club is a very relaxed and supportive environment to be in. We are a group of girls with all different levels of football skills. Some of the players have never played football before but some have more experience. We like to believe that there’s no such thing as a bad shot and we all encourage each other to get better. It’s also worth mentioning that the football club is not just about football. It’s also about creating a safe and happy environment where we girls can come together and have fun while staying active. I strongly encourage any girl at EF Academy Oxford to join us so we can grow our team. We will welcome you with open arms.